Before the arrival of European settlers, Long Island on New England's eastern coastline had its own microcosm of native American tribal life, with competing groups that had their origins in at least two main tribal groups. Richard M Bayles' writings in 1874 painted a detailed picture of the island and its inhabitants. He started with a list of native tribes and their approximate locations. The Canarsee, Rockaway, Merrick, Marsapeague (perhaps better known to modern scholars as Massapequa), Secatogue, and Unkechaug (Unquachog) lived along the southern shore of Long Island. Along the northern shore were the Matinecock, Nesaquake (Nissequogue), Setauket, and Corchaug. At the eastern end of the island were the Shinnecock, Manhasset, and the Montauk. The Unkechaug tribe on the island's southern coast were situated towards the southern side of the settler town of Brookhaven, with their main base at Mastic, and Tobaccus serving as their sachem (chief) in 1664. The Brookhaven's North Shore was inhabited by the Setauket (Setalcott) tribe, which had its tribal centre at Setauket and was a very powerful group. The Montauk, probably the most warlike tribe on the island, had reduced the other tribes or groups to a form of subjugation. Wyandanch, the Montauk sachem, was grand sachem of all the tribes on the island, and his signature was required on the early Indian deeds in addition to that of the sachem of the local tribe when land was purchased by the white settlers. In 1659, Wyandanch conveyed to Lyon Gardiner the territory that comprised the town of Smithtown, which was then occupied by the Nesaquake Indians. This was done in gratitude to Gardiner. He had rescued Wyandanch's daughter from the Narragansett tribe after they had captured her during an invasion of Montauk lands by Narragansett from across the sound. Wyandanch seems always to have been the friend of the settlers, and it was no doubt this friendly interaction between him and the white settlers that made their relations with the Indians of Long Island so peaceful and harmonious. 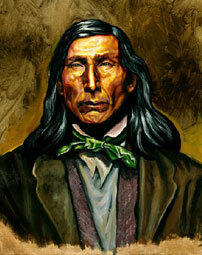 Wyandanch refused to enter into any conspiracy with the tribes from across the sound and always maintained a friendly attitude towards the white settlers. Many a monument has been erected to those less worthy of memorial than Wyandanch, the white man's unwavering friend, whose grave lies unmarked in the solitude of Montauk. The Indian names for Long Island are said to have been Sewanhacky, Wamponomon, and Paumanake. The first two are said to have come from the abundance of the quahog, or hard clam, the shell of which furnished wampum, which was first used as money in the settlements. 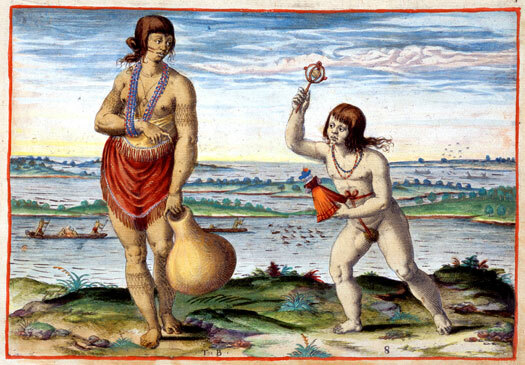 The Indians of the island were tall and straight, muscular and agile, with straight hair and a reddish-brown complexion. 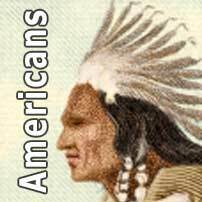 Their language was Algonquian, the highly descriptive tongue in which John Eliot wrote the Indian Bible, and was the language which greeted the Pilgrims at Plymouth. It is doubtful that there is anyone now living who can speak this tongue, which was used freely in those early days. At the time of the first white settlement on the island, the Indian population was very large, as shown by the shell banks found at various places around the shores of bays and coves. Their settlements were always near the shores on the north and south sides of the island, as it was here that they found most of their food, this being fish and clams, and their transportation was by canoe along the waters. The forests toward the middle of the island were their hunting grounds for wild game, and clearings were made where they planted Indian corn, placing a fish in each hill for fertiliser. In 1653 the Narragansett Indians, under Ninigret, one of their chiefs, invaded the territory of the Montauks, and triggered a war that lasted for several years. It would have resulted in the entire extinction of the Montauk tribe if they had not received help from the white settlers. They were compelled to abandon their villages and flee for safety to East Hampton, where they were kindly received and protected. 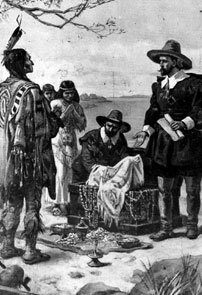 The commissioners sent supplies and military materials to the towns of Easthampton and Southampton, and to the Indians. They also stationed an armed vessel in the sound under the command of Captain John Youngs, with orders to wreck Ninigret's canoes and destroy his forces if he attempted to land on the island. This war seems to have continued until about 1657. It left the Montauks in a very much weakened condition. Soon after the original purchase of land from the Indians had been made at Setauket in 1655, and this land had been divided into lots or 'accommodations' between the settlers, these pioneers began to explore the island beyond their holdings. They discovered large meadows of salt hay and grass on the island's south shore which could be harvested for their cattle. In 1657, Richard Woodhull, acting for the town, purchased two large tracts of meadow land from the Unkechaug Indians at Mastic. One of these meadow areas was at Noccomock, a region on the eastern bank of the Connecticut (Carman's) River, whilst the other was in the southern part of Mastic, along the bay's front. The deed to these meadows, the second earliest recorded, is dated 20 July 1657. The price paid was the usual assortment of axes, guns, powder, lead, and knives, gathered from the settlers who hoped to use the land. Evidently the Unkechaug Indians were displeased with the deal for their land, which had been transacted by Wyandanch, sachem of the Montauk tribe, and grand sachem of all the Long Island tribes, or groups, as they are sometimes called. A committee was appointed at a town meeting on 22 August 1671, to go to the Indians and settle the dispute, and to carry 'som Likers with them to the Indians on the town's account'. The committee was apparently successful, whether by reason of the 'likers' or otherwise, and the same land was repurchased in 1674 from Tobaccus, the new Unkechaug sachem. The town of Brookhaven now owned all the 'mowable meadow land, whether higher land or lower that lieth between a river called Connenticut, to another river called Mastic'. This was called the 'New Purchase'. During these years other tracts of land were purchased from the Indians, and one in the southern part of the town is the 'Old Purchase at South', which included parts of the communities now known as South Haven (the western part), Brookhaven and Bellport. This purchase was made from Tobaccus on 10 June 1664, for four coats and six pounds ten shillings in cash (US$16.25). The original deed and receipt for payment are still preserved amongst old papers in the Brookhaven Town Hall at Patchogue. The small settlement thrived as the years went by. Land was cleared and planted, grist mills constructed, and the town government more clearly developed. The increase in population was slow as Brookhaven, like her sister towns, was an exclusive community. The rules regarding the buying of land by anyone not already a freeholder of Brookhaven were clearly defined. The following regulation was passed at a town meeting on 8 March 1664: 'To the end that the town be not spoiled or impoverished, it is ordered that no accommodations shall be sold piece meal, but entire, without the consent of the Constable and Overseers, or the major part thereof'. The town kept a vigilant eye upon the character of its inhabitants, and individuals who wanted to join the settlement were generally placed on probation for a term of three to six months. At the end of that time, if their character and behaviour were approved, they were admitted to the privileges of freemen, and allotted certain portions of land, with the same rights as the other settlers. Committees were appointed to investigate the character and reputation of proposed settlers, and if they did not prove satisfactory to the townspeople, they were directed to leave within a specified time. No individual inhabitant was allowed to sell or lease property to a stranger who had not been accepted by the town as a proper person to be a member of the settlement. By enforcing these restrictions, the society of the first settlements was kept measurably free of undesirable persons. The town of Brookhaven is the largest on Long Island. It extends across the island from the sound to the ocean, and is about twenty miles long, east to west. The towns of Smithtown and Islip are located to the west, and Riverhead and Southampton are to be found to the east. During the early part of the year 1655, a party of six men from the colonies of New England landed on the shores of those beautiful bays and coves around Setauket. They purchased from the Setalcott Indians, who were centred on this particular region, a tract of land that extended from Stony Brook to and including Port Jefferson, and gave the Indians in payment, '10 coats, 12 hoes, 12 hatchets, 50 muxes (small brad awls), 100 needles, 6 kettles, 10 fathoms of wampum, 7 pipe bowls of power, 1 pair of children's stockings, 10 pounds of lead, and one dozen knives'. The deed was dated 14 April 1655, and contained the signature marks of the Setalcott sachem, Warawasen or Warawakmy, and fourteen of his tribesmen. The settlers also were given the right to let their cattle run beyond the bounds of their purchase, and to cut timber as far east as they pleased. The Indians and the proposed settlers agreed to live peaceably with each other, which they did. The first settlement was called Ashford, and later Brookhaven, and finally Setauket, and was located around the 'meeting house' green at Setauket. 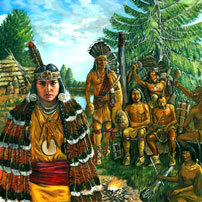 The land upon which the town was built were purchased from the Indians at different times by the early settlers. It was later held by the fifty-four proprietors as tenants in common, and was divided amongst them as occasion demanded. In some of these divisions an extra share was made for the support of the minister. Those first settlers at Setauket soon began to explore the southern side of the town, where they discovered large meadows of salt hay and grass which could be harvested for their cattle. 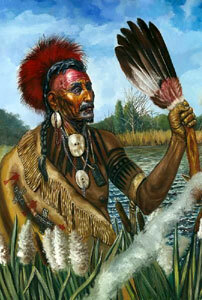 In 1657, they purchased two tracts of meadowland from the Unkechaug Indians, who had their main base at Mastic. The settlers purchased from Tobaccus, chief of the Unkechaug Indians, on 10 June 1664, the entire tract of land that extends from Yamphanke Creek in South Haven to a small pond in the western part of Bellport, and north to the middle of the island. On the same day, Governor Winthrop of Connecticut purchased from Tobaccus all of the land to the west of this to the Islip Town line at a creek called Nampkee in the western part of Blue Point. On this tract were built the communities of East Patchogue, Patchogue, and Blue Point. This was underdeveloped for many years and was not annexed to Brookhaven Town until 1773, by an act of the Colonial Assembly. The town also purchased at the same time from the Setalcott chief all of the land on the north side, between Mount Sinai to Wading River, and south to the middle of the island. Old Field was purchased from the Indians sometime before 1659. A patent was issued by Governor Nicolls on 7 March 1666 for all of the land that had been bought or should be bought from the Indians, bounded on the west by a line running across the island at Stony Brook, and on the east by a line at Wading River. On 19 November 1675, the Setalcott chief, Gle, conveyed to Richard Woodhull who was acting for the town all unsold land within the limit of the patent to the middle of the island, and also confirmed all former grants, with these covering all of the land that was claimed by the Setalcott Indians from Stony Brook to Wading River. A second patent for the town was issued by Governor Dongan on 27 December 1686, which included all former grants, and named John Palmer, Richard Woodhull, Samuel Erburne, Andrew Gigg, William Satterly, Thomas Jenner and Thomas Helme as trustees. A tract of land on the south side of the town extending east from the Connecticut (Carman's) River to the Mastic River and north to the middle of the island was purchased from the Indians by Colonel William Smith in May 1691. This also included the Great South Bay, the island in it, and the ocean beach, and was known as the Manor of St George. A patent for this immense tract of thousands of acres was issued by Governor Fletcher in 1693. A certain Mr Smith later purchased most of the land east of this to the Southampton Town line at Eastport, for which he received a patent in 1697 from Governor Fletcher. In 1659, the town requested an alliance with Connecticut for protection against any possible invasion by the Indians or the Dutch to the west end of the island. On 16 May 1661 Hartford voted to receive Brookhaven Town and appointed Richard Woodhull and Thomas Pierce as magistrates. This continued until 1664 when the English took over the Dutch settlement at New York, which included Long Island. The duke of York appointed Richard Nicolls as governor. Original text is free from copyright, with updates and amendments © Mick Baker. An original feature for the History Files.